It was June 29, 1995 at 5:55 p.m., when Sampoong Department Store located in southern Seoul suddenly collapsed, resulting in approximately 1,400 casualties. The building’s structural integrity started to weaken when the floor, of Chunwon Restaurant, located on the fifth floor began to crack. Shockingly, however, there were no emergency measures taken to warn patrons, and failure to evacuate the customers in the building directly led to their avoidable demise. 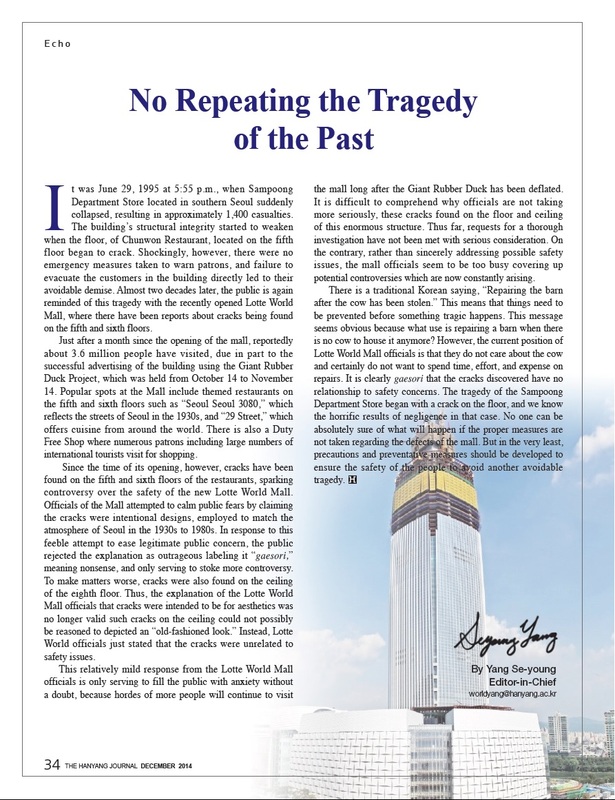 Almost two decades later, the public is again reminded of this tragedy with the recently opened Lotte World Mall, where there have been reports about cracks being found on the fifth and sixth floors. Just after a month since the opening of the mall, reportedly about 3.6 million people have visited, due in part to the successful advertising of the building using the Giant Rubber Duck Project, which was held from October 14 to November 14. Popular spots at the Mall include themed restaurants on the fifth and sixth floors such as “Seoul Seoul 3080,” which reflects the streets of Seoul in the 1930s, and “29 Street,” which offers cuisine from around the world. There is also a Duty Free Shop where numerous patrons including large numbers of international tourists visit for shopping. Since the time of its opening, however, cracks have been found on the fifth and sixth floors of the restaurants, sparking controversy over the safety of the new Lotte World Mall. Officials of the Mall attempted to calm public fears by claiming the cracks were intentional designs, employed to match the atmosphere of Seoul in the 1930s to 1980s. In response to this feeble attempt to ease legitimate public concern, the public rejected the explanation as outrageous labeling it “gaesori,” meaning nonsense, and only serving to stoke more controversy. To make matters worse, cracks were also found on the ceiling of the eighth floor. Thus, the explanation of the Lotte World Mall officials that cracks were intended to be for aesthetics was no longer valid such cracks on the ceiling could not possibly be reasoned to depicted an “old-fashioned look.” Instead, Lotte World officials just stated that the cracks were unrelated to safety issues. This relatively mild response from the Lotte World Mall officials is only serving to fill the public with anxiety without a doubt, because hordes of more people will continue to visit the mall long after the Giant Rubber Duck has been deflated. It is difficult to comprehend why officials are not taking more seriously, these cracks found on the floor and ceiling of this enormous structure. Thus far, requests for a thorough investigation have not been met with serious consideration. On the contrary, rather than sincerely addressing possible safety issues, the mall officials seem to be too busy covering up potential controversies which are now constantly arising. There is a traditional Korean saying, “Repairing the barn after the cow has been stolen.” This means that things need to be prevented before something tragic happens. This message seems obvious because what use is repairing a barn when there is no cow to house it anymore? However, the current position of Lotte World Mall officials is that they do not care about the cow and certainly do not want to spend time, effort, and expense on repairs. It is clearly gaesori that the cracks discovered have no relationship to safety concerns. The tragedy of the Sampoong Department Store began with a crack on the floor, and we know the horrific results of negligence in that case. No one can be absolutely sure of what will happen if the proper measures are not taken regarding the defects of the mall. But in the very least, precautions and preventative measures should be developed to ensure the safety of the people to avoid another avoidable tragedy.